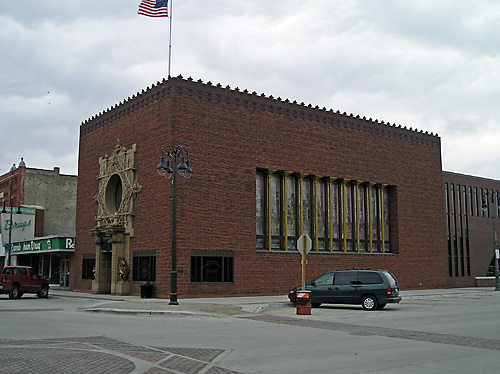 After Owatonna, the best-known of Sullivan’s banks, and the model for most of his succeeding bank buildings. 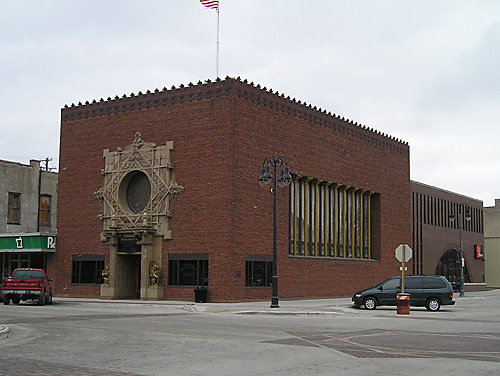 It was named one of the ten Iowa buildings of the 20th century (representing the decade 1910-1919) by the Iowa Chapter of the America Institute of Architects. 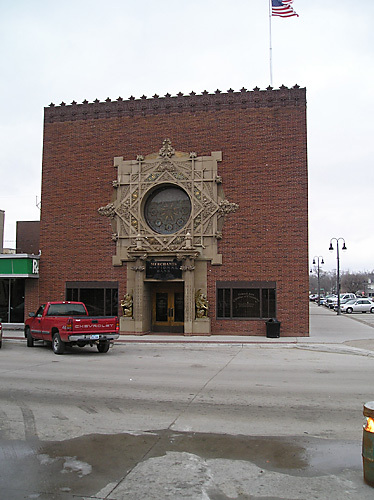 Though the building is still owned by Wells Fargo, the bank now occupies only the 1970s addition, and rents the historic building to the Grinnell Chamber of Commerce. 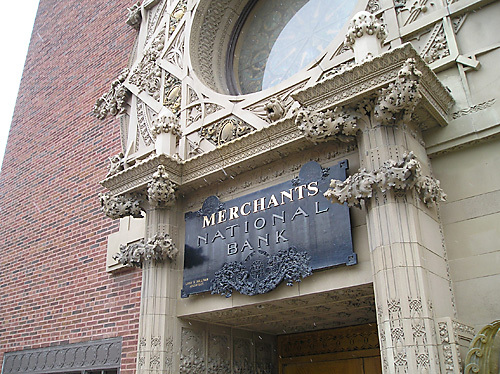 As a result of the Chamber’s occupancy, the bank is now prominently featured in printed pieces issued by the Chamber. 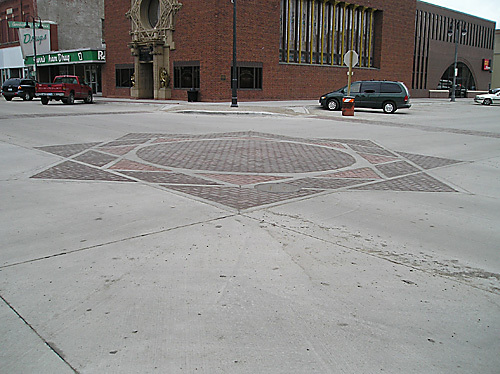 The paving in several downtown intersections recalls the design of the bank’s famed entry. 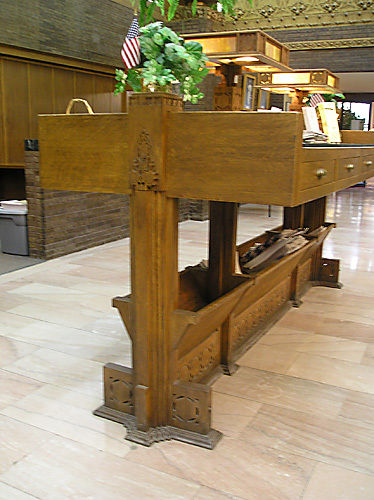 In June 2005 the Walter Burley Griffin Society held its annual meeting in Grinnell. 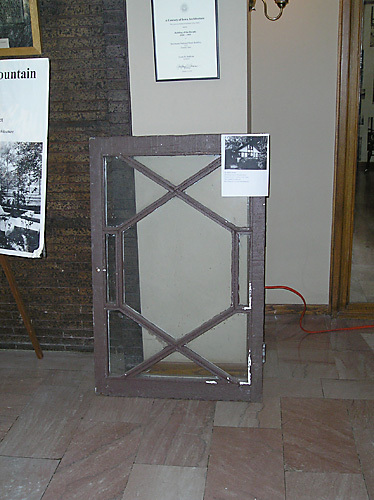 At that time they presented one of the windows from the recently (and senselessly) demolished Marsh House in Winnetka. 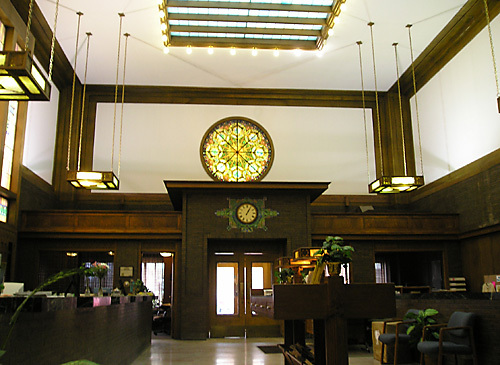 The window, show above at the bank, will eventually be displayed in the Ricker House. Also on display are plans and a model of the E.W. Clark Memorial Fountain that Griffin designed for Grinnell, located in a park on the opposite corner of the intersection from the bank. A reconstruction of the fountain is being considered. 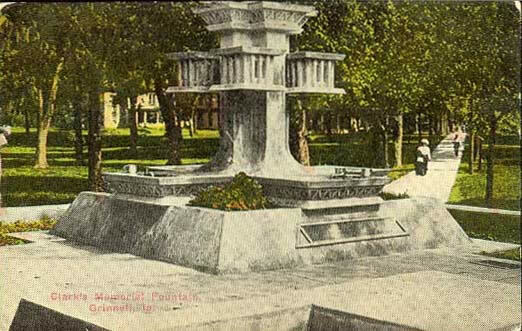 Historic postcard view of fountain. 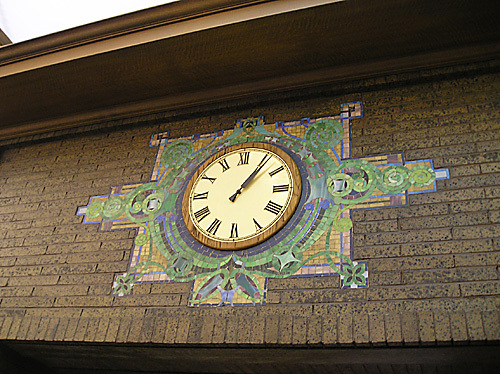 Placed in National Register of Historic Places, 1976. • Gebhard, David, and Mansheim, Gerald: Buildings of Iowa. Oxford: Oxford University Press, 1993, p. 237. • Schmitt, Ronald, E.: Sullivanesque: Urban Architecture and Ornament. Urbana and Chicago: University of Illinois Press, 2002, p. 56, 272. 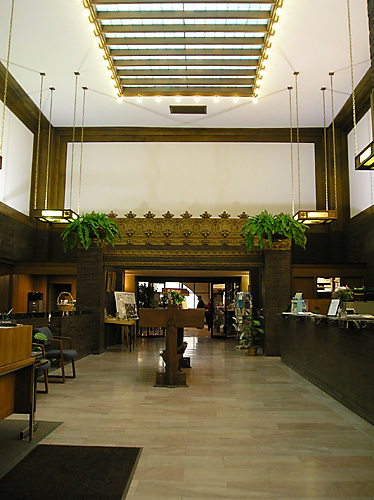 • Wilson, Richard Guy, and Robinson, Sidney K. The Prairie School in Iowa. Ames, Iowa: The Iowa State University Press, 1977, p. 68-69.